This is a very quick soup to make, and it’s so delicious. So easy, give it a try. Chop into 3″ lengths and steam two bunches of farm fresh organic asparagus. While the asparagus is steaming, bake a potato in the microwave. A medium potato usually takes 5-6 minutes to cook, and gives easily when squeezed after baking. Pour 2 cups of organic chicken stock into your Blendtec, or blender of choice. Put the asparagus in the blender, and follow with 4 tbsp of organic butter (salted or unsalted, your choice) I love Kerrygold Butter for just about everything. Chop the potato into 6-8 large pieces, place those in the blender. 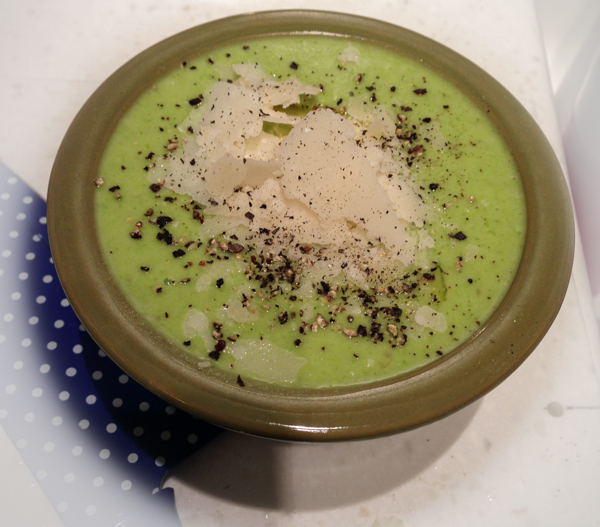 Blend until very smooth, be careful handling this as it will be warm from the asparagus and potato. The asparagus and potato warmth will melt the butter and this adds a heavenly creaminess. Serve yourself some in your favorite bowl, and garnish with a shake of shaved parmesean cheese, if desired, or drizzle with toasted walnut oil. Crack pepper over the top and enjoy.